Students will vote on the funding of The University Times in a referendum in April. Trinity College Dublin Students’ Union (TCDSU) has called a student-wide referendum on the future of The University Times’s funding, after a petition gathered the requisite 500 signatures. Students will vote on whether to remove the salary and accommodation of The University Times Editor, as well as the stripping of funding down to €3,000. The changes to the constitution, if passed, would apply from 2020/2021 onwards. The referendum will take place on the last week of term, with campaigning taking place from Monday to Thursday and voting taking place on Wednesday and Thursday. Calls for campaign managers for both sides will go out this Monday. The petition was launched after the newspaper suffered severe backlash from an article it published, detailing a hazing ceremony that took place on campus, carried out by an elite, all-male society of Trinity sportspeople called the Knights of the Campanile. 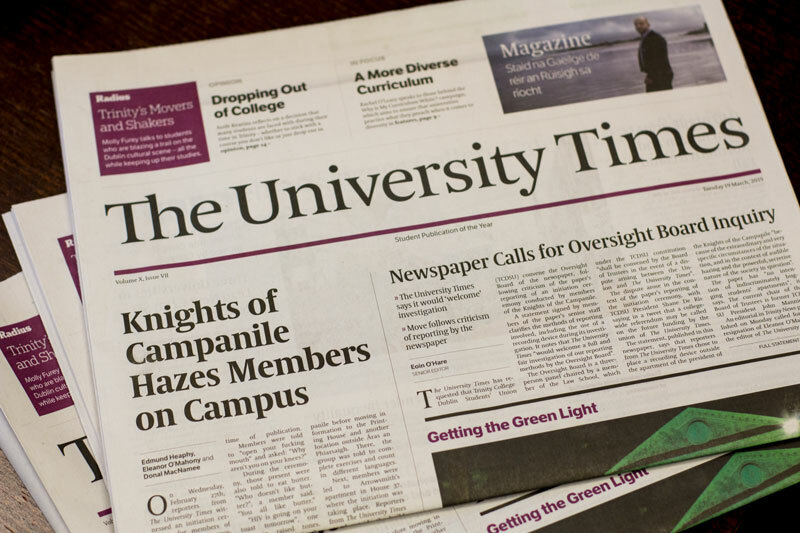 Speaking to The University Times, Editor Eleanor O’Mahony said she was “disappointed to hear that a referendum had been called less than a week after our story on the Knights of the Campanile had been published”. “We will fight against this referendum because we firmly believe in the value of this paper as a service, and the freedom of the press”, she said. If the referendum passes and the constitution is changed, the newspaper will be allocated €3,000 a year to go towards printing – this would cover just one issue. During the night in question, newspaper reporters placed a recording device outside the apartment of President of the Knights of the Campanile, Ben Arrowsmith, where the hazing was taking place. After placing the device outside the door, the reporters waited in the corridor out of sight and listened to proceedings, which could be heard from outside the building. On Tuesday, senior staff members of The University Times released a statement, defending the recording of the ceremony, saying that they had requested that TCDSU Board of Trustees convene the Oversight Board of the paper to investigate the reporting. Trinity News on Friday reported that a complaint had been sent to the Junior Dean concerning the investigation. On Monday, the Editor of Trinity News, Niamh Lynch, and Contributing Editor Rory O’Sullivan called for O’Mahony’s resignation. Earlier this year, The University Times reported on a culture of hazing within Dublin University Boat Club (DUBC), which was picked up by major national news outlets. The investigation revealed that, in the last decade, novices have often faced a night of excessive drinking, commands to strip to their underwear, and whipping with bamboo sticks.